Acts To Be Made At A Visit To The Blessed Virgin Mary. "Most Holy Immaculate Virgin, and my Mother Mary, to thee who art the Mother of my Lord, the Queen of the world, the Advocate, the Hope, and the Refuge of sinners, I have recourse to-day, I who am the most miserable of all. I render thee my most humble homages, O great Queen, and I thank thee for all the graces thou hast conferred on me until now; particularly for having delivered me from hell, which I have so often deserved. I love thee, O most amiable Lady and for the love which I bear thee, promise to serve thee always, and to do all in my power to make others love thee also. I place in thee all my hopes; I confide my salvation to thy care. 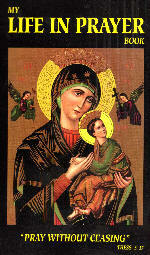 Accept me for thy servant, and receive me under thy mantle, O Mother of mercy. And since thou art so powerful with God, deliver me from all temptations, or rather obtain for me the strength to triumph over them until death. Of thee I ask a perfect love for Jesus Christ. Through thee I hope to die a good death. O my Mother, by the love which thou bearest to God, I beseech thee to help me at all times, but especially at the last moment of my life. Leave me not, I beseech thee, until thou seest me safe in Heaven, blessing thee and singing thy mercies for all eternity. Amen. So I hope. So may it be.